A majority of Americans would like to see more women in leadership positions in business and politics, but many are skeptical that there will ever be gender parity in these positions, even as more women move into management roles and run for office. The public largely says it’s easier for men than it is for women to get top executive positions in business and to get elected to high political offices – a majority of men and women say this is the case – but there is little consensus between the two genders about what is holding women back from these positions. For example, 72% of women – vs. 48% of men – point to women having to do more to prove themselves as a major reason why their gender is underrepresented in higher political offices. And while about six-in-ten women (59%) see gender discrimination as a major obstacle for women in politics, 36% of men share this view. These patterns are repeated when the public is asked why there aren’t more women in top executive positions in business. Women are also more likely than men to see benefits to female leadership for Americans overall and for women and men in particular. Large majorities of men (71%) and women (82%) say that having more women in top leadership positions in business and government would improve the quality of life for women at least some, but while two-thirds of women see some positive impact for men as well, a far smaller share of men (47%) do. When it comes to the impact a growing number of women in leadership positions would have on the lives of all Americans, 78% of women say it would have at least some positive impact, compared with 59% of men who say this is the case. The survey also finds that there are large partisan gaps in views of where the country stands when it comes to the number of women in leadership positions as well as the obstacles women face in getting these positions. In some cases, the gap between Republicans and Democrats is even more pronounced than the gap between men and women. 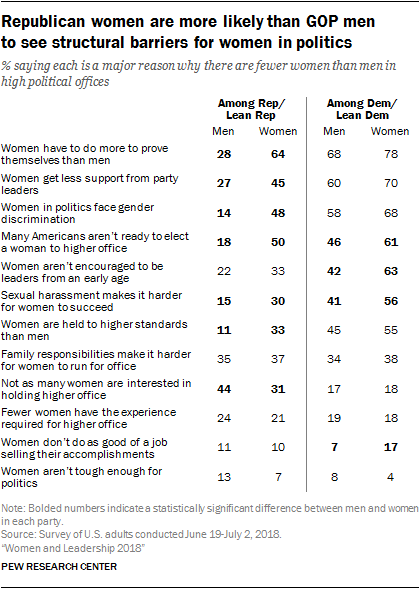 For example, while there is a 21-percentage-point gap in the share of women (69%) and men (48%) saying there are too few women in high political offices, there is a 46-point gap between Democrats and Democratic-leaning independents (79% say there are too few women in these positions) and Republicans and those who lean Republican (33%). Democrats are also far more likely than Republicans to point to structural barriers, such as gender discrimination, as major reasons why women are underrepresented in business and political leadership. 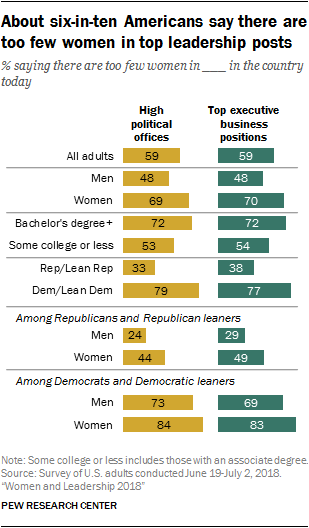 About six-in-ten Americans say there are too few women in high political offices (59%) and in top executive positions in business (59%) in the U.S. today; about a third say there is about the right number of women in political (34%) and business (35%) leadership positions, and small shares say there are too many women in these roles (6% and 4%, respectively). Women are far more likely than men to say there are too few women in top leadership positions in the country these days. Roughly seven-in-ten women (69%) say there are too few women in high political offices, compared with about half of men (48%) who say the same. This is nearly identical to the share of women (70%) and men (48%) who say there are too few women in top executive positions in business. The partisan gap in views about the number of female leaders is even wider than the gender gap. Fully 79% of Democrats and Democratic-leaning independents say there are too few women in high political offices, compared with 33% of Republicans and those who lean Republican. A majority of Republicans (57%) say there is currently the right number of women in these positions; just 17% of Democrats share this view. Democratic and Republican women are more likely than their male counterparts to say there are too few women in leadership. Some 44% of Republican women think there are too few women in high political offices, compared with 24% of Republican men. Among Democrats, majorities of men (73%) and women (84%) say there are too few women in these positions. Among those who say there are too few women in top leadership positions in politics and business, about eight-in-ten say that, ideally, there would be equal numbers of men and women in these positions. Relatively small shares say that there should be more women than there are now but still not as many women as men, or that there should be more women than men in leadership positions. Majorities of Democrats and Republicans who say there are too few women in top leadership positions see gender parity as the ideal situation. However, Republicans are more likely than Democrats to say there should be more women in these positions than there are now but still not as many women as men. When it comes to business leadership, 23% of Republicans who say there should be more women in top executive positions in business say the ideal situation would be for women to continue to hold a minority of these positions; just 8% of Democrats say this is the case. Two-thirds of Americans (67%) say it is generally easier for men to get elected to high political offices; just 5% say it is easier for women, and 27% say there is not much difference. Views are nearly identical when it comes to top executive positions in business: 67% say it is easier for men to get these positions, while 6% say it is easier for women and 26% don’t think there is much difference. Majorities of men and women say it is easier for men to get top leadership positions in business and politics, but this view is particularly prevalent among women. About three-quarters of women say it is easier for men to get elected to high political offices and to get top executive positions in business (74% each), compared with about six-in-ten men who say the same. The gender gap in views of who has a better shot at being elected to higher office is evident among those ages 18 to 34, 35 to 49, and 50 to 64. The pattern is somewhat different when it comes to top executive positions in business. In this case, only among those younger than 50 is there a significant difference in the shares of men and women who think it is easier for men to get these positions. About eight-in-ten women ages 18 to 34 (80%) and 35 to 49 (78%) say this is the case, compared with fewer men in these age groups (65% and 56%, respectively). Women younger than 50 are more likely than older women to say men have it easier when it comes to getting top leadership positions in politics and business, although large majorities in each group say this is the case. About eight-in-ten women ages 18 to 49 say it’s easier for men to get elected to high political offices (80%) and to get top executive positions in business (79%). About two-thirds of women ages 50 and older share this view (68% when it comes to both political and business leadership). Republican men are far less likely than Republican women, as well as Democratic men and women, to say it is easier for men to get top leadership positions. 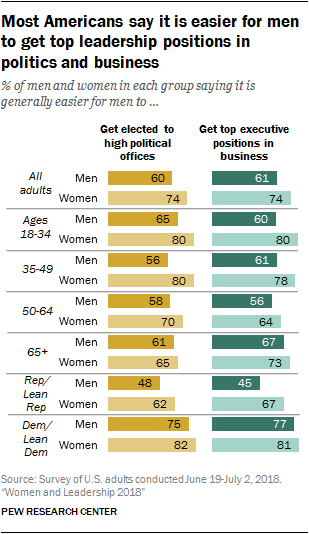 About half of Republican men (48%) say men have a better shot at getting elected to high political offices, and a similar share (45%) say it’s easier for men to get top executive positions in business. In contrast, about two-thirds of Republican women say it’s easier for men to get top leadership positions in politics and business; among Democrats, about three-quarters of men and about eight-in-ten women say the same. Americans see similar obstacles for women in politics and business. For example, about six-in-ten say that women having to do more to prove themselves than men is a major reason why women are underrepresented in high political offices (61%) and in top executive positions in business (60%). About half say gender discrimination is a major barrier for women in each of these realms (49% and 54%, respectively); a similar share (52%) cite women getting less support from party leaders as a major reason why there are fewer women than men in high political office. 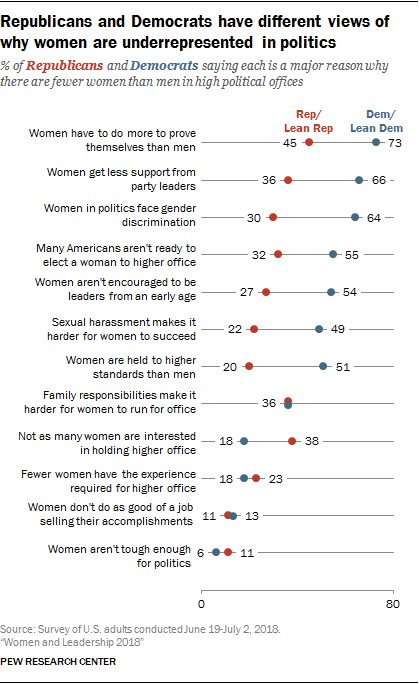 Other items cited by about four-in-ten Americans as major reasons why women are underrepresented in high political offices include voters not being ready to elect women to these positions (45%), women not being encouraged to be leaders from an early age (42%), sexual harassment making it harder for women to succeed (38%), and women being held to higher standards than men (37%). Similar shares see these as major barriers for women in business. When it comes to the major obstacles for women seeking top executive positions in business, about a quarter point to women not having access to the same kinds of personal connections and networks as men (27%), women having fewer opportunities to interact with people in senior positions outside of work (24%) and women being less likely to ask for promotions and raises (24%). Americans are more likely to cite family responsibilities as a major reason why there aren’t more women in top leadership positions in business (44%) than as a major reason why women are underrepresented in high political offices (36%), and they also have different ideas of how having children might impact women in each realm. About half of the public (51%) says that, in general, it’s better for a woman who wants to reach high political office to have children before entering politics; 26% say it would be better to wait until she is well-established in her political career, while 19% say it would be better for a woman who aspires to higher office to not have children at all. 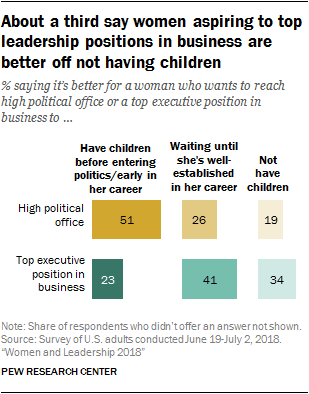 When asked about women who want to reach a top executive position in business, about a quarter (23%) say it’s better for them to have children early on in their career, 41% say they are better off waiting until they are well-established, and 34% say it’s better for them to not have children at all. Those who see family responsibilities as a major barrier to female business leadership are particularly likely to say women who aspire to these positions are better off not having children: 39% say this, compared with about three-in-ten of those who see family responsibilities as a minor reason (29%) or not a reason (30%) why women are underrepresented in top executive business positions. Perceptions of what contributes to the underrepresentation of women in political and business leadership positions vary widely across genders. For example, while at least seven-in-ten women cite women having to do more to prove themselves as a major reason why there are fewer women than men in high political offices (72%) and in top executive positions in business (74%), about half of men say the same (48% and 45%, respectively). A majority of women also point to women getting less support from party leaders (61%), gender discrimination (59%) and voters not being ready to elect women (57%) as major barriers for women in politics. 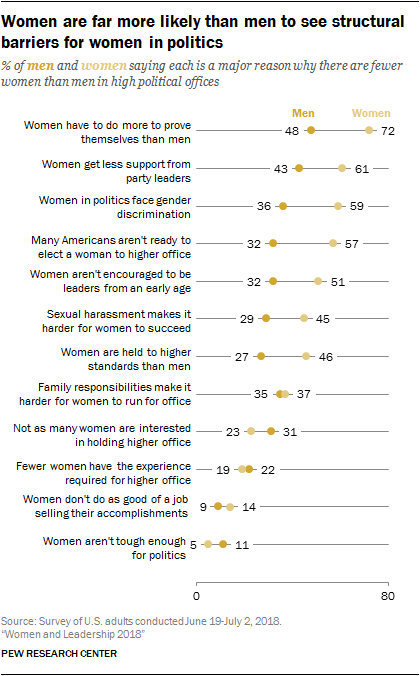 In contrast, fewer than half of men see each of these as major reasons why there aren’t more women in higher office (43%, 36% and 32%, respectively). By double digits, women are also more likely than men to point to women not being encouraged to be leaders from an early age (a 19-percentage-point difference), sexual harassment making it harder for women to succeed (16 points), and women being held to higher standards than men (19 points) as obstacles for women in politics. In turn, men are more likely than women to say women simply aren’t as interested in holding top leadership positions in politics and business. About three-in-ten men (31%) – vs. 23% of women – say this is a major reason why there are fewer women than men in high political offices. And while 22% of men say not as many women are interested in top executive business positions, 13% of women say the same. Republicans and Republican-leaning independents are less likely than Democrats and those who lean Democratic to see structural barriers for women in business and politics. This gap is driven in part, but not exclusively, by the views of Republican men. Overall, about three-quarters of Democrats (73%) say women having to do more to prove themselves is a major reason why there aren’t more women in high political offices, compared with 45% of Republicans. Half or more Democrats also point to women getting less support from party leaders (66% vs. 36% of Republicans), gender discrimination (64% vs. 30%), Americans not being ready to elect women (55% vs. 32%), and women not being encouraged to pursue leadership positions from an early age (54% vs. 27%) as major barriers for women in politics. Partisan gaps are also pronounced when it comes to views of why there aren’t more women in top executive business positions. For example, about eight-in-ten Democrats (78%) point to women having to do more to prove themselves, compared with 38% of Republicans. And while 73% of Democrats say gender discrimination is a major obstacle for women in business, 30% of Republicans say the same. The gender gap in views of what’s holding women back is particularly wide among Republicans and Republican-leaning independents. A majority of Republican women (64%), as well as most Democratic men (68%) and women (78%), cite women having to do more to prove themselves as a major reason why women are underrepresented in high political offices; just 28% of Republican men say this is a major reason. And while about half of Republican women say voters not being ready to elect women (50%) and gender discrimination (48%) are major obstacles for women in politics, about one-in-five or fewer Republican men say the same (18% and 14%, respectively). The gender gap is generally less pronounced among Democrats and those who lean Democratic, but there are some significant differences between Democratic men and women. For example, about six-in-ten Democratic women say women not being encouraged to be leaders from an early age (63%) and voters not being ready to elect women (61%) are major reasons why there aren’t more women in high political offices; smaller shares of Democratic men say the same (42% and 46%, respectively). Many Americans are skeptical that women will ever be able to overcome the obstacles keeping them from achieving gender parity in business and political leadership. About half of Americans (52%) say that, as more women run for office, it is only a matter of time before there are as many women as men in high political offices; a similar share (48%) say that, even as more women run for office, men will continue to hold more of these positions in the future. Similarly, 53% expect to see gender parity in top executive positions in business as more women move into management roles, while 46% say men will continue to hold these positions in the future. Women express more skepticism than men about the possibility of gender parity in top leadership positions in business and politics. About half of women say men will continue to hold more high political offices (53%) and top executive positions in business (52%) in the future. Among men, a majority say it is only a matter of time before there are as many women as men in top positions in politics (57%) and business (59%). A majority of the public says that having more women in top leadership positions in business and politics would improve life for all Americans – and, specifically, for women and men – at least some, but relatively small shares see the potential for a large positive impact. About seven-in-ten Americans say having more women in leadership positions would do a lot (29%) or some (40%) to improve the quality of life for all Americans. Smaller shares say having more women in leadership roles would not do much (21%) or would do nothing at all (10%) to improve life for Americans. When asked about the impact on each gender, Americans are twice as likely to say a growing number of women leaders would do a lot to improve the quality of life for women (36%) than to say it would do the same for men (18%). Perhaps unsurprisingly – considering that women are more likely than men to say there are too few women in leadership positions – there is a gender divide in how people see the impact of more women holding these positions. About four-in-ten women (41%) say this would do a lot to improve the quality of life for women, compared with 31% of men who say the same. 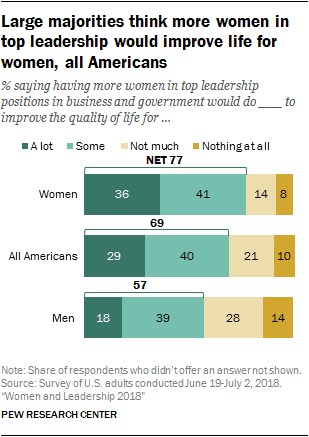 There are also double-digit differences in the shares of women and men saying more women in leadership would do a lot to improve life for all Americans (17 percentage points) and for men (10 points). Partisans are also deeply divided. Half of Democrats say that having more women leaders would do a lot to improve things for women in this country, compared with 19% of Republicans who say this. By a 43% to 11% margin, Democrats are more likely than Republicans to say having more women in leadership positions would do a lot to benefit all Americans. And while about a quarter of Democrats (27%) see this doing a lot to improve life for men, just 7% of Republicans agree. More than one-in-three Americans (36%) say that more women in leadership positions would do a lot to improve the quality of life for women in America, up from 29% in 2014. The bulk of that change has come from Democratic men, who are now roughly twice as likely as they were four years ago to say more women in leadership would improve women’s lives. In 2014, one-quarter of Democratic men said that more women in leadership would do a lot to improve the lives of women in America; today that number is 46%. By contrast, opinions of Republican men, Republican women and Democratic women on this issue have remained relatively stagnant.